Melissa & Doug’s Magnetic Wand Number Maze is great for teaching children about quantity in a fun and concrete way, as well as being a perfect travel game. The problems that require solving are that the child must match the number of magnetic balls to the number in the basket. This means adding to and taking away from various baskets. Children are learning about addition and subtraction in an incidental, informal way. The board is covered by a clear perspex sheet. Your child will slide the attached magic want across the clear cover filling the baskets with red apples (red magnetic balls). 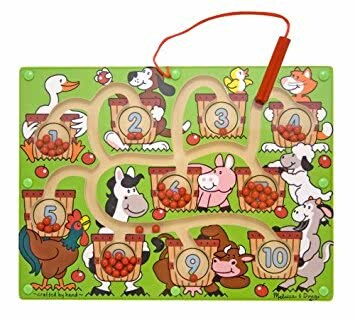 None of the balls can fall out/off the board. The wand is securely attached to the wooden board by a string so that it cannot detach and get lost. This game can be conveniently slipped into a child’s backpack and taken in the car, on planes, trains or buses. I have used this toy with my own children on our travels for years. The Melissa & Doug Magnetic Wand Number Maze was reviewed by Nikki Bush for Toy Talk. It was selected for Nikki’s highly recommended short list of games and toys in 2013 and continues to be a regular recommendation when parents are looking for a number game or a travel toy.